Today I'm wearing bright clothes to counterbalance the grey weather. 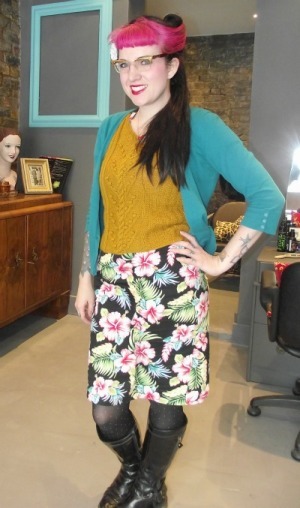 I'm wearing a Collectif tropical print dress, with a mustard jumper (with short sleeves) and then a turquoise cardigan. I oddly found the cardigan by accident. I found it near our table after a Wonderful Women meeting, and I took it home thinking it was one of theirs. The bar was empty by that point. Turns out it didn't belong to anyone! I tried to be helpful at least! I'm wearing my Annabelle's Wigs Sleek Pony, which just ties around your own little pony tail.